Got Any More of that Pigeon Pie? Ahh, life in the middle ages, that was when it was at. It was an era when all you needed to mend your roof was a bunch of dry twigs and sticks like the ones pictured here. People were eating crazy foods like roasted hedgehogs and pies with live animals in them (this was an amusement rather than an actual course of the meal). There were no songs singing, "Baby, baby, baby" all over again. Instead, lyrics were all about the "Hey, Nonni Nonni" instead. Who's Nonni? No idea. But what a fun word to sing! Yeah, the Renaissance Era had it's up and downs. People weren't really into bathing and there was a little bug going around called "the plague". But in the end, we all know deep down inside that those people from the Medieval Era just have more fun. 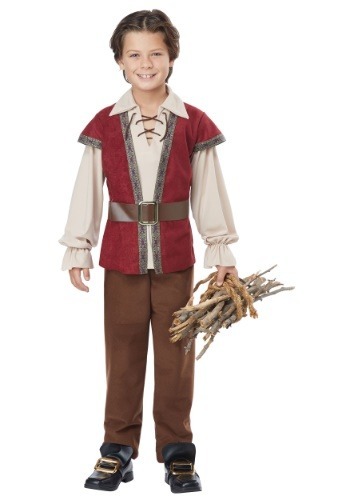 Your child will be ready to celebrate Midsommers Eve in Medieval style with this classy Renaissance Boy costume. He'll look right at home playing page boy to a night with the billowy sleeves of the blouse that's layered under a jerkin. (That's a fancy historical word for vest) The look comes together with elastic-waisted pants and a wide faux leather belt that cinches the waist in. While the nobility might live in castles and rock all the velvet clothing, we like to think that the lower classes have more fun. They definitely have better dances! No matter what rank your kid is aiming for, they'll tread the line with this simple look. Dress it up with a fancy hat, dress it down with a little dirt on the cheeks. 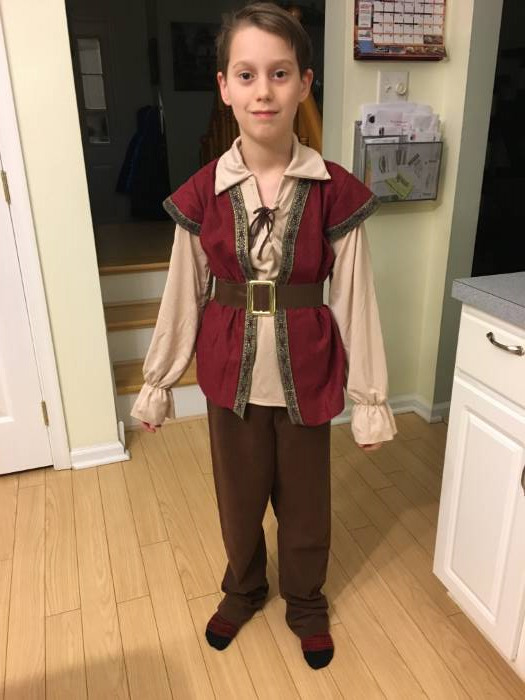 Whether you're heading to the Ren Fair with the whole family or your child simply wants to go the historical route for Halloween, he'll be ready to let out a healthy, "Hey, Nonni Nonni" once he throws on this cool look! Love this outfit! My son will be using this for a play/dance. It was affordable and exactly what we were looking for! He’s 11, less than 80 pounds and is wearing a large in this picture.